Guest Blogger: BOW MY! DECK YOURSELF OUT IN SOMETHING SPECIAL THIS CHRISTMAS - CounterCultural. CounterCouture. Welcome to my first ever guest blogger post! Hopefully each month one of my friends will be sharing something of their style insight and what inspires their outfits. My first guest is Fiona Clapperton, Fee to her friends. I first met Fee at UEA where we both studied History. A lover of all things vintage and womanly, Fee was the first to reply to my request and offered to write something for the festive season. Considering that she is currently studying a Masters in History at Cambridge University, Fee deserves a massive round applause for this wonderful guide to feminine, festive dresses. I hope you enjoy reading it as much as I did. A week’s worth of advent calendar chocolates have been eaten, Love Actually has already been on the telly, and the aroma of mulled wine is lingering in the air. Even if you have so far managed to escape these Yuletide omens, it’s very likely that you’ve already pencilled the first Christmas party into your diary. Without a doubt, your social calendar will soon be overwhelmed by an assortment of festive functions. And who doesn’t love an excuse to dress up and make merry? Yet, with the shops chock–full of party dresses it’s easy to feel a little bewildered. Searching for the perfect frock can be a time–consuming and elusive enterprise. Really, at this time of year, it’s almost as though there is too much choice. Mini, Midi or Maxi? Sequins or Lace? Lady In Red or LBD?Recently, as Christmas started to conquer my own calendar, I began to meditate on what look I wanted to achieve this holiday season. Like usual, I turned to television and cinema for inspiration.! Had you asked me earlier in the year what my ideal festive frock would be, I would have immediately responded: Gatsby Glamour. Baz Luhrman’s epic staring the effortlessly chic Carey Mulligan has had a profound impact upon fashion. Suddenly, slinky dresses covered in sequins were ‘in’. The 1920s was a decade of dazzling style, and like a magpie, I have always been attracted to glitz. 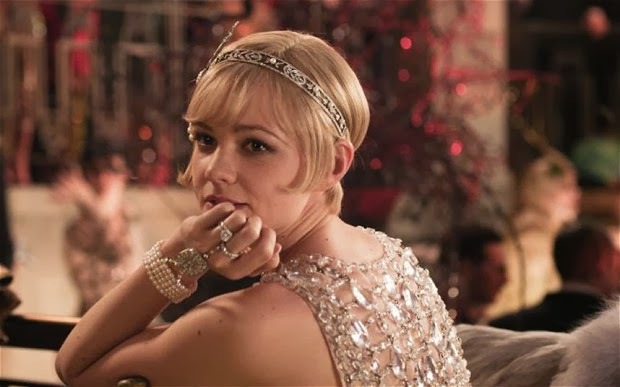 However during the latter–half of November, as I started seriously pondering on whether or not to ‘splurge’, I came to the realisation that Gatsby–style has been done. Well. Really well. 1920s embellished dresses are everywhere, and unless you are really willing to splash the cash, you are likely to run into at least two other party guests wearing a very similar dress (if not the exact same one) at whichever soiree you are attending.! I had a sort of epiphany. What could be more festive than a bright, jewel–coloured dress bedecked with a bow? I realised that I had always underestimated bows, always considered them a bit, well, ‘twee’. Joan’s dress showed that they most certainly did not have to be! So I began searching for my own version of the ‘present’ dress. I was not aiming for a copy of the Mad men outfit. I did admire its curve– embracing pencil shape, just above–the–knee length, and enticing low back. However, what I was really looking for was a Christmas dress in fitting with my own personal style. An outfit which would compliment my wardrobe whilst standing out as special. 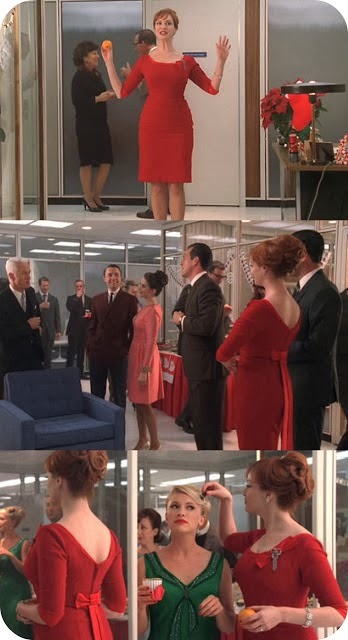 And the concept is so versatile that any women can find her own version of Joan’s dress. Need more proof? 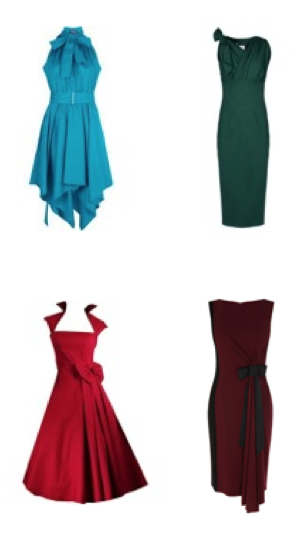 Here are some dresses to inspire you. I already had a vague idea in mind. I knew that I to find a purple dress which hit just above the knee. 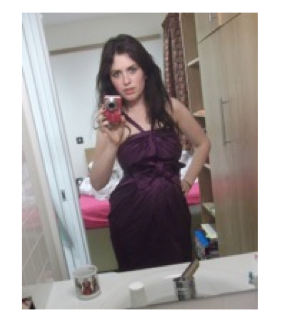 After some searching, I managed to find this silk number on Ebay for £5 – what a bargain! So what are you waiting for? Deck yourself out in something special this Christmas. Bow my indeed!